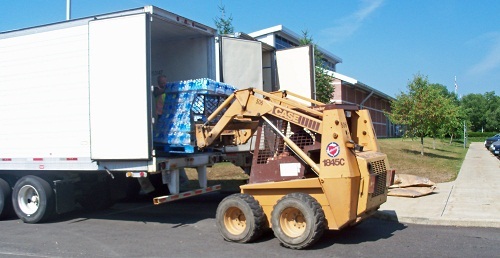 Water being unloaded at the Athens Recreation Center July 02, 2012. West Virginia and Ohio are recovering from severe storms that caused widespread power outages. Both have declared states of emergency. Richard Belisle of the Herald-Mail newspaper reported on Monday that 40,000 worth of food had been ruined in Jefferson County, West Virginia when the power went off. This food was meant for the summer feeding program for children. Dr. Sheri Hoff of the Jefferson County Public Schools said Tuesday morning, “At this time, we have not been able to replace the lost food. We had hoped for assistance from the FDA but have not heard back yet.” Jefferson County has a childhood hunger rate of nearly 14 percent according to a Feeding America study making summer feeding programs very critical. To donate to the Mountaineer Food Bank visit their home page. You can also donate to Matthew 25: Ministries or Ohio Association of Foodbanks.